Find or create an image that encapsulates the background and border of the element. Import the image into your theme as a multi-image. Slice the image into a 9-piece border if you want the element to be able to adapt to different sizes. This process is described in great detail in this blog post. This process is extremely flexible, since you can use it to convert pretty much any design into an app. However, for many common use cases such as rounded borders, I would prefer to be able to automatically generate these image borders and backgrounds without having to create an image, import it, and slice it. The new Codename One CSS library allows you to do just that. The library enables you to create entire themes using only CSS, but in this post, I’m going to focus on its ability to automatically generate image backgrounds and borders for your apps. The following a CSS definition for a minimal rounded button. At compile-time, the CSS library compiles the CSS file into a codename one resource file. 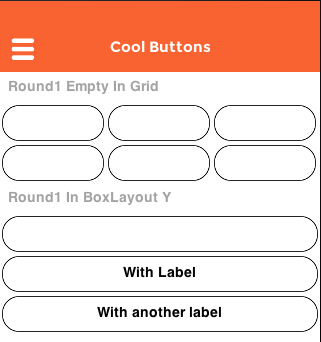 Each element selector (in the example above this is "Round1") is converted into a UIID/Style that can be referenced from your codename one application. If the CSS styles specified can be expressed completely by Codename One style properties (e.g. padding, margin, font, simple borders, etc…​), then the resulting UIID will be more or less a direct conversion of the CSS properties. If, however, the CSS styles mandate a background or border that Codename One cannot express using its regular styles (e.g. rounded corners, shadows, gradients), then an appropriate image border or background will be generated and saved in the resource file as a multi-image. 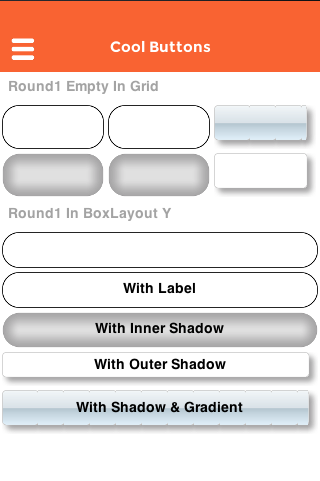 In the above example, we specify that the "Round1" UIID should include rounded corners with a radius of 20pt. Since Codename One doesn’t support rounded corners natively, the CSS module will (at compile time) generate a an image with the appropriate rounded border and use this in an image border for the "Round1" UIID. 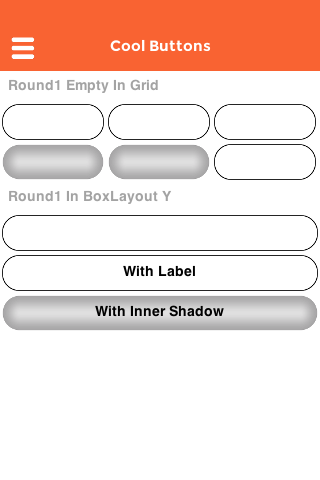 This defines a new UIID named "Round1InnerShadow" that derives from the "Round1" UIID (i.e. inherits all of its properties), but changes to a transparent border, and adds an inner shadow. Let’s shift gears a bit and make a button that is a little less round, but has a subtle drop-shadow. 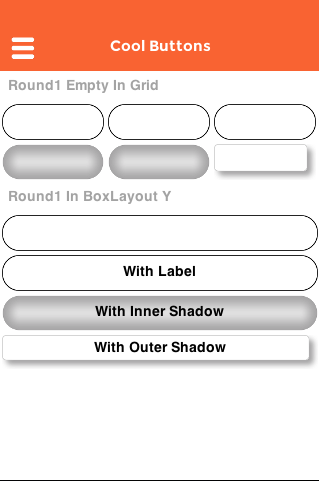 In this case we reduce the border radius to 5 dips, and we have removed the inset marker from the box-shadow property so that the shadow will be outside the button. After some experimentation I also found that a little bit of padding helps for the look of the button in this case. I could go on and on with different cool CSS effects that you can generate, but I’ll stop at this one last one: Gradients. Codename One has been capable of generating gradient backgrounds at runtime for quite some time, but we are told not to use them because they are "slow". Instead we are instructed to create an image with the gradient that we want, and then use it as a background image. Using CSS and the linear-gradient or radial-gradient property, you can have your cake and eat it too since it will generate the gradients as images at compile-time, then use them as image backgrounds (or image borders) in your theme. For those of you who don’t speak CSS fluently yet, you will be happy to learn that the 'net is filled with online tools for generating CSS borders, shadows, and gradients for you. One such tool is this CSSMatic tool. You just enter the values that you want for color, border-radius, etc.., and it spits out some shiny CSS for you to just paste into your stylesheet. Change all px units to pt. This will cause the coordinate to be scaled appropriate for the device density. Where Do I Put My CSS File? "This CSS looks really nice, but where to I put it, and how to I set up the CSS module? ", you say. I’m glad you asked. The CSS compiler will look for .css files inside your project’s "css" directory (which you’ll need to create). 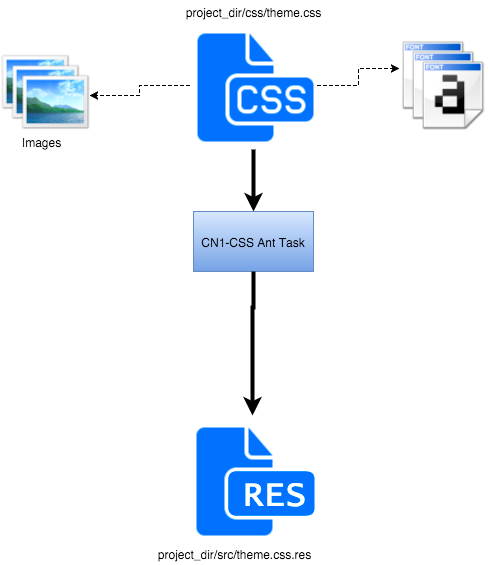 It will compiles these CSS files into corresponding .res files which will be placed into your project’s src directory. You can then load this theme in your app just as you would load any other theme file. You can download the Codename One CSS library and read the installation instructions in the CN1-CSS Repository on GitHub.